Percussion instruments that generate rich, dynamic sounds from the bare hand of the player are perhaps the most physical of all musical instruments. 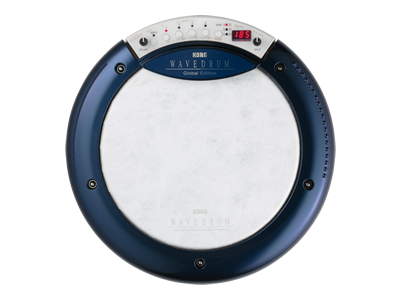 While an electronic musical instrument, the Wavedrum Global Edition is painstakingly designed to retain this level of physicality. The sound of the player&apos;s strike is sensed by separate pickups for the head and the rim, and used directly as the sound source that drives the DSP-powered algorithm and PCM sound engine. 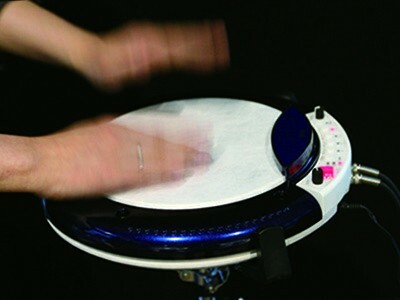 In combination with this, the pressure sensor in the head allows the Wavedrum Global Edition to detect and respond to subtle movements of the player&apos;s fingers or palm which can be used to strike, rub, or scratch the head, as well as use techniques such as open shots, slap shots, heel and toe, and mute. Tonal differences produced by using a stick, mallet, or brush, plus changes resulting from different striking locations are also faithfully reproduced, giving the musician a high degree of expressive power and a broad dynamic range that rivals that of an acoustic drum or percussion instrument. This means that percussionists can bring a substantial arsenal of sounds - to rival a stage full of traditional percussion instruments - anywhere without the sacrificing the real feel or sonic quality that they require for their performance. In addition to conventional drum sounds such as snares and toms, popular percussion instruments such as cajon, djembe, conga, and tabla, as well as metallic percussion such as cowbell and triangle, the Wavedrum Global Edition also provides exotic ethnic instruments and percussion sounds from all over the world, both ancient and modern. For example, the Wavedrum Global Edition allows you to instantly experience The udu, a clay pot percussion instrument; the jegog, a bamboo marimba from the island of Bali; the talking drum of Africa; Arabic percussion such as the darbuka and daf; plus gongs that would require massive setups. There&apos;s also a selection of stringed instruments such as sitar, koto, and berimbau. For each of these sounds, the Wavedrum Global Edition not only gives you a faithful re-creation of the original sound, but also provides new expressive potential that is unavailable from any other instrument. The Wavedrum allows you to instantly experience all of these, enabling you to easily play percussion instruments that normally take years to master. The Wavedrum Global Edition places its main emphasis on strengthened acoustic instruments such as snare, djembe, and conga. This pursuit of realism has given the sounds even greater practicality. The Wavedrum Global Edition lives up to its name by also providing a rich assortment of Latin American and African instruments, such as the balafon, shekere, and dundunba as well as the Japanese taiko drum. Of course, there&apos;s also a full complement of the sound effects and electronic sounds that you would expect from a synthesizer, further broadening your performance potential. We&apos;ve also added sounds for cutting-edge electronic dance music styles such as dubstep and moombahton. The Wavedrum Global Edition generates new expressive potential not merely from its sound, but also from your performance technique. You can make the pitch change randomly each time you strike it, or even specify a scale and play a phrase. 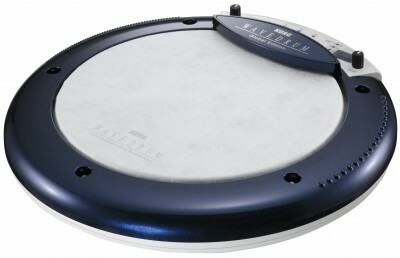 Applying pressure to the head is an expressive technique that&apos;s possible only on the Wavedrum Global Edition. After striking the head with your hand or a mallet, you can apply additional pressure to control the pitch or timbre of the decay, or produce sustained sounds simply by pressing down on the head, creating sound effects that would be impossible on a conventional percussion instrument.